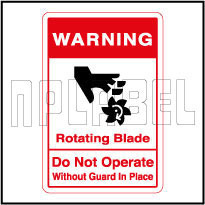 We are providing excellent quality Caution Labels which are used as warnings, workplace safety signs, etc. These are being provided in different sizes, shapes and designs and colours. We develop them with the help of fine techniques and charge competitive rates. These are customized to suit clients’ needs. 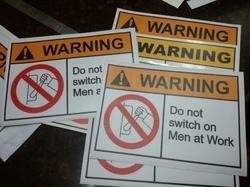 Leveraging on our skilled industry professionals, we are highly involved in offering a wide range of Warning Sticker. These products are made by using the best quality materials which is sourced from our genuine industry vendors. We assure timely delivery of these products to our clients. We provide the products ast a reasonable price to our customers. Our competency lies in manufacturing and supplying to our clients an excellent quality range of Chemicals Sticker. - Widely used at construction sites to show the accidental area. We are offering a wide variety of General Signages - Boards / Metal Plates / Stickers that are mainly used to reflect various messages on roads and are visible from a long distance.